Obsidian Snowflake is a small kennel in Croatia, registered in 2014 by FCI and Croatian Kennel Club and owned by me, Jelena Brkljacic. Since I was a baby, dogs were the biggest love of my life. I remember to always cuddle with the dogs in their crates everywhere my parents took me. Dalmatians were always special to me, so happy, cheerfull, inteligent, loyal and of course, so impressive with their white coat with dark spots. Don´t have to mention they are Croatian native breed which makes them even more special for us. 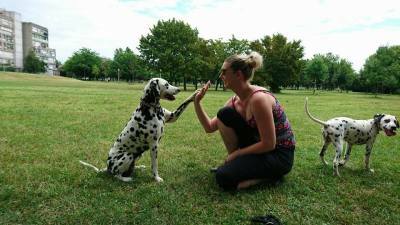 I adopted my first Dalmatian Dina, a liver spotted girl, when I was 19 years old. That was the love at first sight and the moment I started sharing my life with Dalmatians. Seven years ago my Ava came into my life...she was 2 months young Dalmatian with a very special character, something I could only imagine. To that moment I could not imagine a dog could be such a life companion. She is the mother of our A litter. Soon I realized I want her to have a company and me to have more Dalmatians and that was the moment our spotted family began to grow. In 2016 my princess Chanelle arrived. She is my dream Dalmatian, always joyful and smiling, with a beautiful constitution and perfect pedigree. We are now one happy, succesfull and growing family and hope we can bring that joy of life to you! We breed carefully to promote the beauty, health, endurance and inteligence of Dalmatians! Our goal is QUALITY, not quantity!